When I was a kid, we Osburns were obsessed with Mexican food. To be accurate, I should say we were obsessed with Tex-Mex food, which is what tacos, nachos, and quesadillas really are. My Dad had his first taste at Taco Bell as a young man and was hooked, then passed along his hankering to the rest of us. Our fridge was filled with hot sauces and spicy pickles, our cupboards with masa harina and cumin and coriander. My mom made giant layered dip platters for parties and special-ordered cases of exotic nacho chips from the health food store (yes, there was a time when they were unavailable). As a child, I bragged about having eaten seven tacos at one sitting! We even imported a tortilla press home from a visit to the States. With this we brought forth hundreds of fresh-cooked tortillas until the sad day when it cracked from overuse. We just could not pat out tortillas like the Mexican women did, so Mom and I figured out a new way. We put each ball of dough between two cutting boards lined with plastic bags on the floor, then stepped on it. This method produced beautiful, uniform rounds, even better than what our old press turned out. Handmade tortillas are mostly made made from Masa Harina, a special type of corn flour that is treated with lime, or “nixtamalized”. Fresh masa used to be made in every community in Mexico daily, but apparently that has mostly fallen by the wayside and most folks are using Maseca brand, an instant masa that is milled in Texas. I was out shopping the other day and saw that our grocery store had recently stocked it. You just mix it with water, press out tortillas and cook them in a dry cast iron pan. Sean tried them for the first time and was shocked at how good they are, nothing like the dry stale tasting corn tortillas sold next to the wraps. Tucked into a napkin to stay warm, and filled with your favourite taco fixin’s, they are heavenly. Serve these with beans and lots of veggies, and taco night is downright healthy. This is good, because Mexican food can really satisfy a junk food craving! 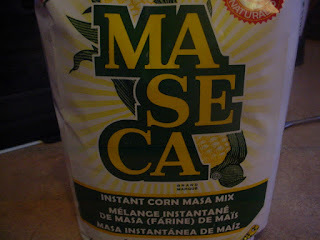 They also make great quesadillas and can even be fried for nacho chips or tostadas. You’ll need a press or two decently sturdy cutting boards, ones that you don’t think will break if you stand on them. You can use medium or large freezer bags to keep the tortillas from sticking to the board, or cut squares from grocery bags. This is way more fun with a kid or two on hand to squish the tortillas for you-if they don’t weigh enough to flatten the tortilla out to 5 or 6 inches, jump up there with them! The recipe is right off the bag, but try our squishing method! Have a cloth napkin lined basket or bowl ready. Heat a heavy frying pan over medium heat. 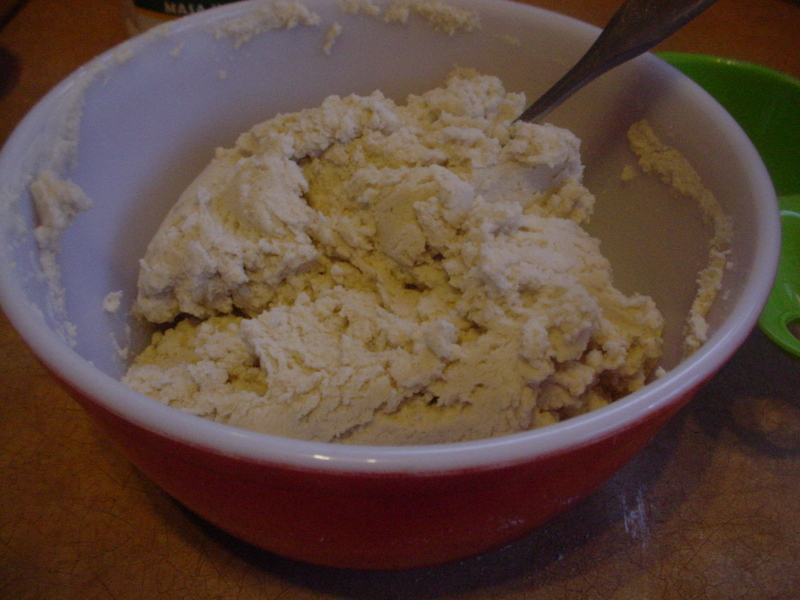 Combine the ingredients in a bowl and stir until a soft dough forms. Divide into 16 equal sized balls (I ball up the dough and cut it in two, then cut each in half and then in half again). Place a cutting board on the floor, then a piece of plastic. Center a dough ball on the plastic, cover with another piece of plastic, then the second cutting board. Stand on the board sandwich, then take the top board off and peel the tortilla off the plastic. Place in the dry pan and let cook for about a minute. Turn, then cook on the other side. When the tortilla is cooked, place it in the napkin and fold over to keep warm while you cook the remaining tortillas. Serve the tortillas at the table with Refried Beans, Salsa and grated Cheese, and any or all of the following veggie options: shredded Lettuce, diced Onion, Tomatoes, Peppers and Avocado, sprigs of Cilantro, Corn, fried Mushrooms, Banana Peppers, Olives…. Heat the olive oil in a pan over medium high heat and add the onions. Saute for about five minutes, until softened but not browned, then add the garlic. Cook another minute, and add the chili powder and cumin. When the spices smell fragrant, add the beans. Cook, stirring occasionally, until mixture bubbles. Reduce heat to medium and let cook about ten minutes, until beans have thickened. Taste and add a little salt if necessary. I'm going to give this a try. Sounds like fun!